Unlike Sri Lanka ,there is no proportional representation scheme in India. The Tamil Nadu poll was held under the first past the post winner system where the winner takes all regardless of the percentage of votes polled.The AIADMK with a few miniscule allies contested in all 232 electorates as a single entity under the party symbol of twin leaves and obtained 134 seats. The AIADMK got 131 while its allies also contesting under the two leaf symbol got 03. The chief opposition Dravida Munnetra Kazhagham (DMK) got 89 while its allies won 09. Of the DMK tally , the Indian National Congress got 08 and the Indian Union Muslim League 01. Tamil Nadu according to the 2011 census has a total population amounting to 72 million(72, 147,030). Of these nearly 58 million are registered voters.The voter turn out on election day was 74.26%. By getting 131 seats the AIADMK won a simple majority in the legislature. AIADMK leader and incumbent Chief Minister Ms.Jayalalithaa Jayaram was sworn in as chief minister. While retaining the portfolios of Public Affairs, General Administration, Home Affairs and Police Jayalalithaa has formed a state government comprising 32 other ministers. Of these thirty – two ministers, three are women. The Jayalalithaa electoral victory has surprised many an electoral pundit. She was not expected to win with a viable majority. Almost all the exit polls predicted a hung Legislative Assembly with the DMK leading. Many analysts predicted a victory for the DMK. The trend in Tamil Nadu for over 25 years has been one where the incumbent administration is voted out. The AIADMK had been in power since 2011. Besides Jayalalithaa’s administration had been faulty and corruption –ridden. The thoroughly inefficient manner in which her administration coped with last year’s rains and resultant floods was a downright disgrace.Jayalalithaa herself had been convicted on corruption charges and forfeited her chief minister post for a period of time. She was even jailed. Subsequently she bounced back after winning an appeal in courts that smacked of judicial corruption. Under these circumstances there was widespread expectation that Jayalalithaa “Amma” like humpty – dumpty would have a great fall at the polls. Apart from the DMK which was widely tipped to win, there were many other political party leaders who entertained notions of defeating and replacing Amma as Tamil Nadu chief minister. There was also much talk of a potential third –party alternative to the AIADMK or DMK prior to the poll. Jayalalithaa however had the last laugh. Not only did she win but she also demolished her opponents who fancied themselves as future chief ministers. None of those parties won a solitary seat. Apart from the AIADMK and DMK only those parties which allied themselves to one or the other won. Jayalalithaa’s victory is perceived as remarkable for an important reason. As stated before the trend in Tamil Nadu since 1989 had been that of the DMK and AIADMK forming alternate governments. In earlier times before 1967 when the Congress Party ruled the roost Kumaraswamy Kamaraj had been chief minister from 1945 to 1957 , from 1957 to 1962 and from 1962 to 1963. Kamarajar won the polls of 1957 and 1962 as incumbent chief minister. Later Muttuvel Karunanidhi of the DMK became chief minister in 1969. He contested as incumbent chief minister in 1971 and won. Karunanidhi was followed as chief minister by Maruthoor Gopala Menon Ramachandran popularly known as MGR in 1977. MGR won the polls of 1980 and 1984 as incumbent chief minister. 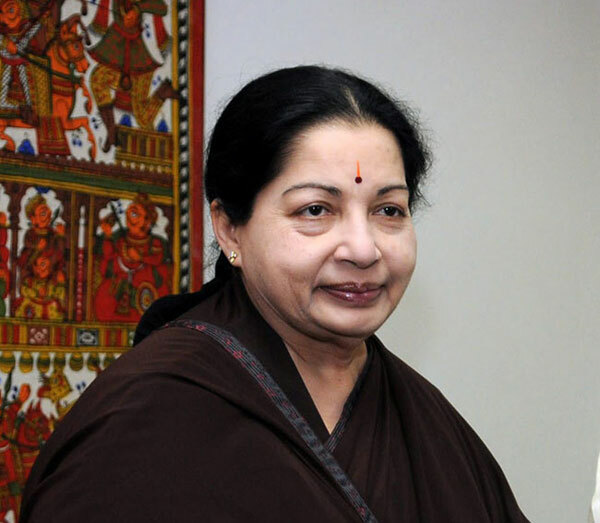 Now after a gap of nearly 27 years the incumbent Tamil Nadu Chief Minister Ms. Jayalalithaa Jayaram has been re-elected. Whatever the reasons or causes for the election result there is no denying that Jayalalithaa Jayaram has triumphed. Her supporters and party members are engaged in a series of events celebrating Amma’s victory. Actress turned politico Jayalalithaa Jayaram is today the uncrowned queen of Tamil Nadu. She has Tamil Nadu at her feet metaphorically and also literally. In the immediate aftermath of the election victory the usually inaccessible Jayalalithaa allowed party members to come up to her and offer their wishes and praises. This they did in a disgusting exhibition of servile sycophancy. Thousands of supporters crawled before their divine “Amma” and prostrated themselves at her feet. Tamil Nadu was once the cradle of the “Suya mariyaathai Iyakkam” or the “Self – respect Movement. Today it is fawning at the feet of Jayalalithaa without a semblance of self – respect. In spite of this “Dravidian” heritage of rationalism and self-respect, it is Tamil Nadu that has allowed film stars to exercise political hegemony like no other. In 1977, M.G. Ramachandran became the first film star to take up chief ministership of an Indian state. N.T. Rama Rao followed suit in adjoining Andhra Pradesh in 1982. In Tamil Nadu, MGR after death was succeeded briefly by his wife Janaki Ramachandran who was herself a former film heroine. Then came Jayalalitha Jayaram, MGR’s ‘leading’ lady with whom he had starred in 27 films. She has been elected thrice as chief minister. As a Tamil wag put it, “MGR is the only actor chief minister who ensured that his actress wife as well as actress paramour succeed him as CM.” Jayalalithaa symbolises the transition from the MGR era to the present. The twin hallmarks of Jayalalithaa have been unbridled corruption and unlimited sycophancy. Jayalalithaa has acted in over 140 films in several languages. Of these around 90 were Tamil films. She acted opposite the famous film star-politico M.G. Ramachandran (MGR) in 28 films. MGR was her lead actor in films, paramour in personal life and mentor in politics.It was MGR who brought her into politics. After entering politics Jayalalithaa became the ADMK’s propaganda and later administrative secretary. She was a Rajya Sabha MP in 1984. In 1989 she entered Tamil Nadu legislature as an elected MLA. Like MGR she too set up a fan club network called the Jayalalithaa Peravai (Federation). Jayalalithaa became a key player on the national scene and enjoyed immense power. Yet much of her conduct was akin to a cheap masala movie where the vamp makes everybody dance to her tune. A few weeks later Jayalalithaa was at the Premier Studio in Bangalore where the shooting of the film ‘Ganga Gowri’ was taking place. The director was the famous Kannadiga filmmaker B.R. Panthulu in whose film Jayalalithaa had first acted as a heroine. A gang of thuggish activists from Vatal Nagaraj’s outfit got to know of this and invaded the studio premises. The mob surrounded Jayalalithaa and demanded that she withdraw her statement of being a Tamil woman and apologise to the people of Karnataka. Javalli had moved to Chennai (then Madras)and was working as an air hostess. She also started acting in dramas and films using the nom de plume Vidyaavathy. After a while Jayalalithaa’s mother also relocated to Madras and stayed with her sister. She worked in a commercial firm and began dabbling in acting. Soon Vedavalli became a full time actress using the name Sandhya. Sandhya as an actress never became a star but was able to garner many roles. She played the ‘leading lady’ in a few films including ‘Minnal Veeran,’ opposite the swashbuckling hero actor Ranjan. Most of her roles however were in a supportive capacity. Meanwhile Jayalalithaa lived with her maternal grandfather and unmarried aunt Padmavalli in Bangalore. “Padma chithi,” as she called her aunt, was like a foster mother to her. Jayalalithaa studied at Bangalore’s famous Bishop Cotton Girls’ school in her early life. She would go to Madras to be with her mother during school holidays.Once Sandhya took her daughter to the studio with her. The film ‘Shree Shaila Mahathmiya’ was being shot. While Jayalalithaa was watching the shooting, a problem arose. The child actor playing the role of Goddess Parvathy in a school drama scene in the film had not turned up. The producer turned to Sandhya. Jayalalithaa was swiftly dressed up as Parvathy and the scene was shot. This was her first screen performance. Sivaji Ganesan also called upon Jayalalithaa to act in films when older. He was definite that she would take to acting. Sivaji predicted then that “Ammu” would become a great film star. Sivaji’s comment did not go down well with Sandhya and Jayalalithaa. Both mother and daughter shared the vision of Jayalalithaa becoming a lawyer. Yet, within five years, Sivaji Ganesan’s prophecy came true. Furthermore Jayalalithaa was to play leading lady to Sivaji himself before the decade was over.Her mother Sandhya and aunt Vidyavathy acted in dramas produced by the famous Y.G. Parthasarathy the father of comedian Y.G. Mahendran. YGP as he was known ran the drama troupe United Amateur Artistes (UAA), which staged English and Tamil plays. Soon Jayalalithaa while a schoolgirl began acting in some YGP plays along with her mother and aunt. She acted in plays such as ‘Malathi,’ ‘The Whole Truth,’ ‘Tea House of the August Moon’ and ‘Under Secretary’. Former Indian President V.V. Giri’s son Shankar Giri saw some of these plays and was impressed by Jayalalithaa. Shankar Giri approached the mother, Sandhya, and told her that he wanted to cast her daughter in an English docudrama called ‘The Epistle’. Sandhya reluctantly agreed with the condition that shooting should be held only during weekends or school holidays. The film however dragged on and was finally released years later when Jayalalithaa was a star. It was a flop.Meanwhile, Jayalalithaa continued with her studies and passed her SSLC/Matriculation exams with flying colours. Her marks were the second highest in the state. Entitled to a merit scholarship, Jayalalithaa obtained admission to Stella Maris College in Madras to follow PUC classes when the academic term began. A brilliant career based on education seemed to be beckoning at that juncture. Destiny decreed otherwise. Sandhya had acted in a Tamil film ‘Karnan’ produced and directed by Kannada filmmaker B.R. Panthulu. The film ran for over a 100 days and a celebration was arranged at the Woodlands Hotel. Jayalalithaa dressed in a silk saree accompanied her mother to the event. She was a “sweet 16” then and a dazzling sight. B.R. Panthulu saw her and immediately decided to cast her opposite Kalyankumar in the Kannada movie ‘Chinnada Gombe’ that he was making. Sandhya demurred saying she would be studying for her PUC in two months’ time. Panthulu promised to finish all shooting within two months. Sandya agreed and Jayalalithaa started acting. She was paid Rs. 3,000. Panthulu kept his promise and completed shooting in six weeks. Jayalalithaa forgot all about films and got ready to attend classes at Stella Maris. It was at this point of time that one of the greatest Indian film directors, C.V. Sridhar saw the rushes of ‘Chinnada Gombe’. Sridhar was planning to shoot a colour film with newcomers under his famous banner Chitralaya Films. He felt Jayalalithaa was ideal to act in the role of a schizophrenic widow in his film ‘Vennira Aadai’ (White Dress). Moving swiftly Sridhar went to the YMCA swimming pool to meet mother and daughter. Sandhya was thrilled that the maestro Sridhar wanted her daughter to act in his film.Jayalalithaa however refused to act in more films. She wanted to study. There was a heated argument at home. Finally Sandhya revealed that the family was in dire straits financially. Acting opportunities were becoming scarce for her and debts were piling up due to their extravagant lifestyle. Being launched by Sridhar meant glowing prospects and a bright future in an acting career. The daughter was asked to make the correct choice. After a long night of deep thought Jayalalithaa conveyed her decision in the morning. It was adieu to studies. She began to get a lot of film offers. The biggest and life-changing break came in the form of B.R. Panthulu again. The man who made the ‘Chinnada Gombe’ Kannada film with Jayalalithaa now wanted to make a colour film in Tamil with the legendary M.G. Ramachandran (MGR).This was the first MGR film by Panthulu. MGR wanted a new face as his leading lady. Panthulu suggested Jayalalithaa. So MGR and wife Janaki watched the Kannada and Tamil film starring Jayalalithaa. It was MGR’s wife Janaki who insisted that MGR act with Jayalalithaa. The film was Jayalalithaa’s second Tamil one. It was based on the Rafael Sabatini character Captain Blood. The film named ‘Aayirathil Oruvanor’ or ‘one in a thousand’ was a block buster. MGR was 48 years old and Jayalalithaa only 17. Despite the 31-year age difference the pair hit it off grandly on screen. More films followed and the duo made 28 films together in nine years. Almost every film was a commercial success. The jewel in the crown was ‘Adimai Penn’ or slave girl with Jayalalithaa in a dual role. The film released in 1969 was produced by MGR himself. It was in this film that Jayalalithaa sang in her own voice for the first time on screen. Usually actors and actresses merely lip synch for the screen while the numbers are actually sung by playback singers. The singers P. Susheela, S. Janaki and L.R. Eeaswari used to voice for Jayalalithaa. It so happened that MGR once heard Jayalalithaa singing softly by herself and felt she sang well. So a solo was given to her in ‘Adimai Penn’. The song ‘Amma Endraal Anbu’ was written by lyricist Vaali and music composed by K.V. Mahadevan. She had a creamy, croony voice and the song got popular. She sang in her own voice in some other films too. Jayalalithaa’s first screen song began with the word “Amma”. Years later millions of supporters are calling her “Amma”! An accomplished dancer, she lit up the screen and stage by her performances. Her dance drama, ‘Kaviri Thantha Kalaichelvi,’ was a smashing success. Jayalalithaa was versatile. She has been a magazine columnist, short story writer, novelist and film producer.Let the last word about her splendid acting career be in the words of her arch enemy in politics Muttuvel Karunanidhi, the DMK leader. The movie ‘Thirumangalyam’ released in January 1974 was Jayalalithaa’s 100th film. There was a felicitation ceremony where the Chief Minister at the time, Karunanidhi, was the Guest of Honour. Recalling that his late leader C.N. Annadurai had once described actress Bhanumathy as “Nadippukku Ilakkanam Vahuthavar” (devised the grammar of acting), Karunanidhi praised Jayalalithaa in similar vein as “Nadippukku ilakkiam vahuthavar,” which meant “devised literature in acting”. While her haughty demeanour and arrogant attitude deserve to be condemned, there is perhaps a rationale for such behaviour. The ascendancy of Jayalalithaa in a Tamil Nadu milieu can be viewed as an ironic contradiction.Despite the breeze of cosmopolitanism blowing in through globalisation, the state of Tamil Nadu is basically conservative. It is a patriarchal, male-dominated society with strict notions of a woman’s role and place - Jayalalithaa is a woman.Tamil Nadu society at large has contempt for women actors in the cine field who do not behave as ‘good’ women should. Woman film stars, in spite of their glamour, are not respected and regarded with disdain in private - Jayalalithaa was an actress.The dominant political ideology in the state is that of Dravidianism. This is based on archaic concepts of the Aryan-Dravidian divide where the Brahmin community is seen as Aryans and other Tamils as Dravidians. Anti-Brahminism is a core element of Dravidian discourse - Jayalalithaa is a Brahmin. Thus, one can see that the Jayalalithaa phenomenon goes against the grain of three dominant concepts in Tamil Nadu. She is a woman, a film star and a Brahmin. The success of this embodiment in the socio-political realm of Tamil Nadu is a contradiction. Jayalalithaa, in a way, is an exception or aberration.In that context, the situation can be quite dicey for her. If she were to be democratic and easygoing, the people surrounding her would exploit it to their advantage. Instead of appreciating her conduct, they would very likely regard it as a weakness and take advantage. Whatever her deficiencies, Jayalalithaa remains a towering figure in Tamil Nadu politics as her arch rival Karunanidhi is an nonagenarian confined to a wheel chair..After his demise, there will be no one in the State to match Jayalalithaa in stature and popularity.”Amma” will then very likely be the solitary moon among lesser stars in the Tamil Nadu political firmament.